The 150th anniversary of Canada celebrates the efforts of many men, women, children, soldiers, politicians, and visionaries. Spectacular events also contribute: the Wolfe – Montcalm face-off on the Plains of Abraham, the American Revolution, the War of 1812, the Fenian Raids, the Lower Canada Rebellion, and the frontier settlers of the Eastern Townships. The settlers were branded as squatters but they insisted that they were not sojourners. The resolve to create a new life was supported by the presence of the church through courageous clergy – fine buildings would come later. Among the clergy who came to Missisquoi Bay was the Rev. Charles Caleb Cotton of the Church of England (Anglican). It was over twenty years since the first families arrived in the Bay area and many newcomers were arriving. The area was briefly served by two short terms missionaries (Robert Quirk Short and James Marmaduke Tunstall) with little success. Cotton held church services wherever it was possible, boarded with a family, and found the people to lack interest and piety. He lasted four years and moved on his own volition to nearby Dunham. The move brought a reprimand from the bishop whose duty it was to transfer the clergy. 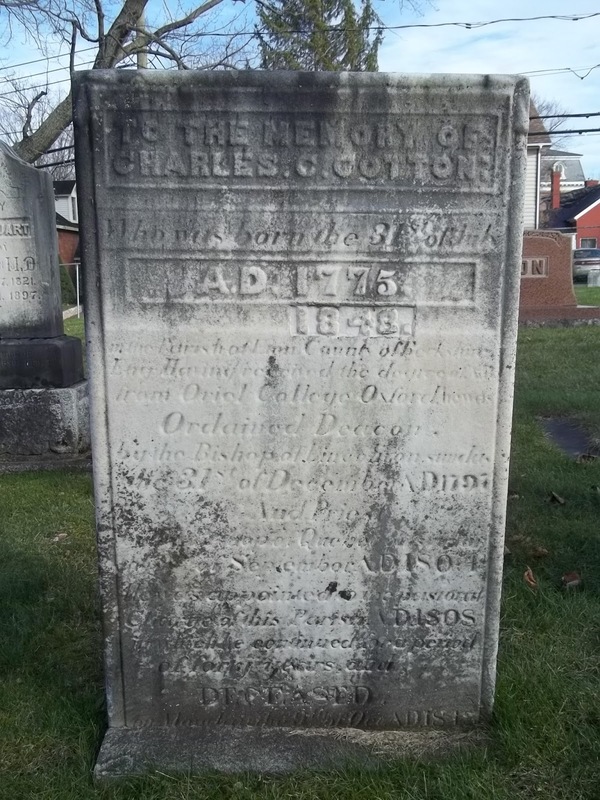 Charles Caleb Cotton was born July 31, 1775 in Eton England. He was the oldest of thirteen children born to his school teacher father and Swiss mother whose father was a French professor at Oxford. Cotton graduated in 1797 and was immediately ordained a deacon. He soon moved to the United States where he taught school but the pay forced him to find church work which took him to New York, New Jersey, and Pennsylvania. 1804 found Cotton in Quebec City and the first priest to be ordained in the new Holy Trinity Cathedral. He was immediately assigned to work in the area of Missisquoi Bay (St. Armand and Caldwell Manor). The move to Dunham was a challenge for Rev. Cotton. He encountered competition from Methodist and Baptist itinerant missionaries. He boarded with a family of eight in a two room cabin; cleared three homestead farms; a church building (All Saints) was erected in 1821.He established a Sunday School, baptized 617 people, married 656 couples, and buried 187 people. He tutored two men for the ministry (Rev. Micajah Townsend and Rev. James Reid). However, his 40 year ministry in Dunham was not without controversy as he once refused to bury a lady who received baptism from some other denomination and was thought to be eccentric in manner and speech. He was one of the few clergy to receive a stipend which meant that he did not have to depend on what money was locally raised. Rev. Cotton married Drusilla Pettis (June 22 1814) with whom he had seven children. A son, Charles Edward Cotton, was a physician in Brome. Rev. Cotton baptized his grandson, Charles Stuart Cotton, in October 1842. He died October 9, 1848 and was buried in the cemetery of Holy Trinity Church, Cowansville. References Brome and Knowlton Church of England in Canada St John & St Peter 1842- 1879, Image 12, Folio 6. Millman, Thomas R. “COTTON, CHARLES CALEB,” in Dictionary of Canadian Biography, vol. 7, University of Toronto/Université Laval, 2003–, accessed April 26, 2017, http://www.biographi.ca/en/bio/cotton_charles_caleb_7E.html.